This article from Gwen Schoen in the Sacramento Bee tackles what can be an intimidating prospect for the Amateur, Part Time Gourmet...baking intricate looking Artisan Breads at home. Yeast is one of the most difficult ingredients to balance and judge correctly. She looks at how the King Arthur Flour Co. is going across the country in an effort to educate home bakers on taking the intimidation factor out of yeast. She talks to one of the one of the Kinig Arthur instructors, who shared a few tips. One of the basics she teaches is how to judge the amount of flour called for in a recipe. For example, a recipe might list a range of 4 1/2 to 5 1/2 cups of flour. "The amount varies depending on the amount of moisture in the flour and the air," Hack said. "You always begin with the smaller amount of flour and gradually add more until the dough is the correct consistency. If you add too much, the bread will be heavy and dry. If you don't add enough, the dough will be dense and sticky inside. Experience will tell you when the dough feels right in your hands." Another problem beginners have is judging when the bread is done. Hack recommends using an instant-read thermometer. Most breads are done when they reach 190 degrees. Denser breads such as a hearth-style or whole-grain should be baked to 205 degrees. There is also some information on how to best use whole grains. "In most recipes, you can substitute whole-grain flour for about half of the amount called for in the recipes. 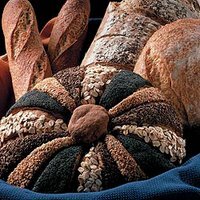 Besides whole wheat, you can also add some interesting seeds and grains to most recipes. Try using oats, rye flakes or sunflower, poppy and sesame seeds. Usually you can use up to a cup of seeds for every 3 1/2 cups of flour in the recipe." You know how when you buy one of those breads from the bakery and the best thing about it is the chewy crust. She tells you how this is done as well. One important step in making rustic, artisan breads is using steam in the oven to make a chewy crust. It can be done by placing a cast-iron skillet in the oven with a small amount of hot water, or you can spray water inside the oven when you place the loaves of bread inside. "There are many tricks to creating steam, and you do need to be very careful," Hack said, "but steam is that step that makes rustic breads so good." MVPizza: What's your game-day fave? Just what do Bay Leaves DO anyway?